How often do you encounter plastic on a daily basis? Many people are aware of the larger plastics, such as plastic bags, plastic bottles, and plastic containers and their negative impact on marine life when they make their way to our waterways and oceans. However, how many people are aware of the hidden micro-plastics and microfibers found in common household items, such as, clothing and face cleaning products? These tiny plastics, often not visible to the human eye, enter our local waste water treatment plants through our household waste water, such as, drainage from washing machines, sinks, and toilets then exit into our local water ways. Just as with the larger plastics, these micro-plastics enter marine environments where they are ingested and also cause harm to marine life. Micro-plastics are often classified in two ways. See Figure 1. In order to help me gain a better understanding of the research project, Dr. Conkle, the head of The Coastal Health and Water Quality (c-HaWQ) Lab in the Department of Physical & Environmental Sciences at Texas A&M Corpus Christi shared the follow links: How your clothes are poisoning our oceans and food supply and Your clothes are polluting the ocean every time you do laundry the articles not only increased my personal understanding and awareness of micro-plastics and their potential harmful impact on the environment, but also helped me learn some important vocabulary and information associated with micro-plastics. I was excited about the environmental purpose of this research and its connection with the impact human activity has on the environment not only for personal reasons, but also because the topic will be very interesting and informative to my middle school students. In order to accurately answer the research question of “Does the waste water treatment plant remove most of the micro-plastics from the waste water prior to being released into the local marine system?”, samples will be taken from the waste water in flow (where the waste water initially enters the treatment plant, the waste water out flow (where the waste water ends and exits the treatment plant) and activated sludge tanks – bio solids (treated sewage sludge), the samples will be filtered and analyzed under a microscope for micro-plastics. Sampling took place biweekly (once every two weeks), with two samples of waste water being collected from each of the following locations (using 4L amber glass bottles): Waste water inflow, Activated sludge tanks, and Cleaned outflow. Bottles were filled approximately halfway to facilitate sterilization with an autoclave. This should result in a total of 12 samples being processed each month (~24L). Additionally, A 2kg sample of pressed bio solids were collected with each sampling. Utmost care was taken to sterilize all tools (and people) involved so as to minimize the spread of harmful waste. Water samples will be collected in three places at each wwtp. Water sampling will involve using a collector to pour approximately 2.6L of wastewater into an appropriately marked amber glass bottle (leaving enough space to easily autoclave). Biosolids (pressed activated sludge) will be collected from the press room and stored in the five gallon bucket. All samples must be sterilized using an autoclave (a device that uses high pressure and high temperatures to sterilize samples) before being worked with (to prevent the spread of disease and contaminants). After being autoclaved, samples will be filtered into 1000uL, 300uL, and 50uL (uL is a symbol used to represent a microliter) partitions and dried before having the organic matter destroyed using 30% hydrogen peroxide. This solution will then be filtered onto a glass fiber filter, before being analyzed under a microscope to identify plastics. Upon returning to the lab, samples were sterilized to prevent the spread of hazardous materials. For liquid samples: Amber glass bottles should be filled to the line (approximately 2L) with the caps loosened. Make sure the Autoclave is set to “liquids”, properly filled with water, and sealed. Autoclave at 125 C for 30 minutes, then let cool for an hour before retrieving. For Solid samples: Place biosolids in a hazardous material bag, and place in a properly filled/sealed autoclave. Autoclave samples at 125 C for 15 minutes, then let cool for 1 hour before retrieving. Once boiling has subsided, return the beaker to the hotplate and boil for another 30 minutes. If organic matter still persists in the beaker, repeat steps 4-6 again. At this time, no results are available. The research project is still in its early stages and methods of how to efficiently and effectively process the beginning samples is still in process. 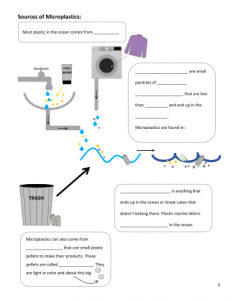 Based on the data collected so far, it seems like most of the micro-plastics are accumulating in the bio solids and are in the form of plastic particles and the majority of micro-plastics exiting the wastewater treatment plants are microfibers. I really enjoyed looking through the bio solid samples because of the abundance and diversity of the micro-plastics. The bio solids contained micro sized clear, pink, blue, aqua, and turquoise plastic particles. At this time, the bio solids are transported to the landfills in the form of dried sludge. Although these micro-plastics are not entering our waste waters, they are still left to accumulate in the landfills. Whereas, the microfibers making their way through and out of the wastewater treatment plants are being deposited directly into our local waterways. Students need to be aware of not only the plastics they can see, but also of those that are microscopic and unseen to the naked eye. It is only then can they be aware of what types of hidden plastics are in their everyday lives and how they are identified. Lesson Summary: Each person’s actions have a collective and cumulative impact on the world, either in a positive or negative way. Marine debris is one issue facing our world’s ocean that is largely preventable through human actions. Marine debris is anything that does not belong in the ocean, from abandoned ships to tiny plastic fibers from clothes. Plastic marine debris less than 5mm is classified as micro-plastics. Micro-plastics can come directly from personal care products with microbeads and laundry lint that washes down the drain, or indirectly from larger plastic debris that fragments into smaller and smaller pieces in the ocean. 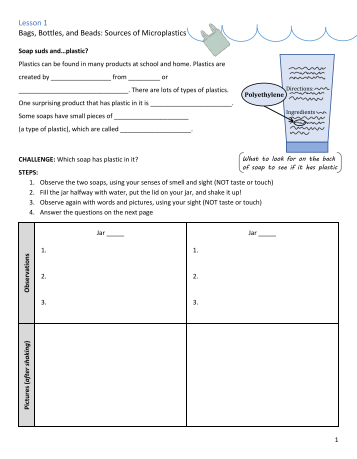 This curriculum includes three lessons intended to engage 6-8 grade students with the issue of micro-plastics in the ocean, analyzing both the problem and possible solutions. The lessons are structured to include opportunities for student inquiry, as well as collaboration and engagement with real data collected by scientific researchers working in the field. Each lesson includes an estimated length, which will vary by classroom. 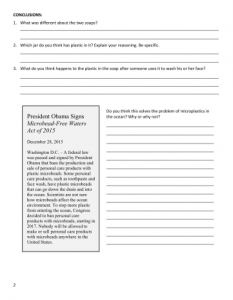 Below is the first lesson converted into a 5E Lesson using Texas Standards. Everyone’s actions have an impact (both positive and negative) on the environment. Scientists make observations, ask questions about the world, collect and analyze data, and work collaboratively in a continuous, nonlinear process. Due to the physical properties of plastics, they have specific impacts on the marine environment. Designing a solution to a problem requires collaboratively defining and constraining the problem, as well as testing and redesigning possible solutions. 112.19. Science, Grade 7, Beginning with School Year 2010-2011. Show students It’s a Plastic World Video . Then Say: Look around the room and silently find as many plastic objects as you can in ten seconds/go! Time students for 10 s., then have students share some of the objects they identified. Ask: Raise your hand if you agree that there is a lot of plastic in this classroom? If you agree that we use a lot of plastic in our daily lives? Say: We use plastic every day, and many of the plastics are single-use. They are designed to be thrown away after being used once. We might not even realize all the products that have plastic, and we don’t always know what happens to them after they are thrown away. Say: Some products with plastics might surprise you. First, we will talk a little about plastic itself, and then you will have a chance to investigate for yourself. 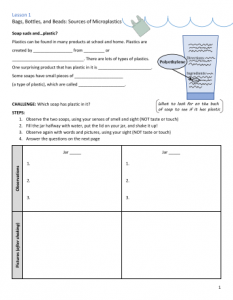 Students will complete the guided notes on page 1 of their notebooks. Students read and follow the directions in their notebooks. 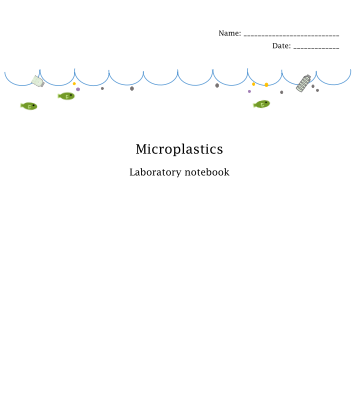 Say (referring to the image on page 1): Polyethylene is the plastic most microbeads are made from, and you can identify products with microbeads by looking at the ingredients for polyethylene. Repeat after me, “polyethylene.” Hand out two jars, labeled “A” and “B,” to each student group, but don’t tell them which soap is which. Students read and follow the directions in their notebooks. Presentation slides also have activity directions for reference. Students fill jars halfway with water, close tightly, and shake the jars to dissolve the soap (there shouldn’t be any soap stuck to the bottom). Students write down what they observe and draw pictures in their notebooks of how the particles behave inside the soaps. Students answer the questions in their notebooks on page 2. 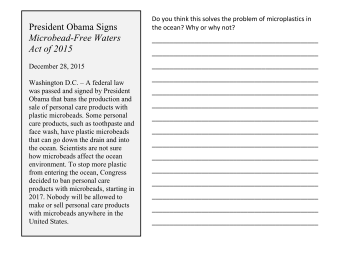 *NOTE: Do not answer the last part regarding the ban of microplastics. This will be answered in the Evaluate portion. Ask: What did you notice that was different between the two jars? How did the particles in the soaps behave? Which one do you think has plastic in it? What evidence do you have? Reveal the answer, that “A” has microplastics in it! “How do microplastics make it to the ocean?” Say: One of the reasons the microplastics problem is not solved by this law is that there are many other ways microplastics get into the ocean. Presentation slide show slide #5. See the student example for notes. Say: There are two main ways that microplastics enter the ocean. One is directly as small pieces (show microplastics definition and have a student read it aloud). Plastics in toothpaste, face wash, and laundry lint can go directly into the ocean. Most microplastics are from larger plastic marine debris items that are fragmented once they get to the ocean (show marine debris definition and have a student read it aloud). Nurdles are small plastic pieces used in factories to make plastic products. Say: Now that we know about microplastics and where they come from, we are going to learn about a researcher who studies microplastics. 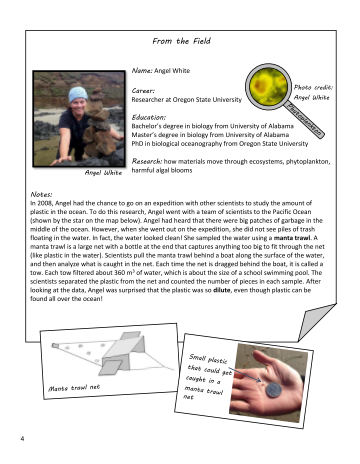 Students will read “Real researcher: Angel White” on page 4 of the student notebook as an introduction to her data. 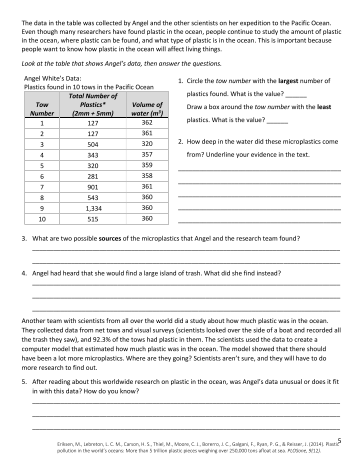 Students will answer the questions about Angel’s data on page 5. See student example for correct responses. Answers are based on the data table and reading. Say: Why is it important to study the amount of plastic in the ocean? Do a think-pair-share (students silently think about their response for 30 seconds, share with a partner, and then share with the class). Ask: Why do you think scientists study microplastics in the ocean? What should scientists like Angel do with their results? 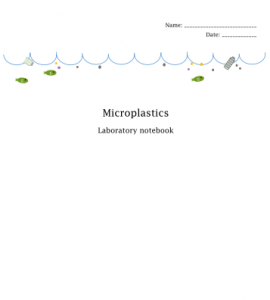 Students will read the article, “Success Story: Banning Personal Care Products with Microbeads” on the bottom of page 2 of their notebooks, then answer the question, “Do you think this solves the problem of microplastics in the ocean? Why or why not? Microplastics Microplastics are very small pieces of plastic marine debris, less than 5 mm in size, that end up in the ocean. Marine debris can be found in the ocean and rivers worldwide, and most of the debris is made up of plastic. Properties of plastics Plastics are long chains of hydrocarbons called polymers. Hydrocarbons usually come from petroleum or natural gas. There are several types of plastics with different physical properties that are used for different purposes. Polyethylene is the largest volume of plastic used in the world. Polyethylene is the plastic that makes up microbeads in some personal care products, such as face wash and toothpaste. Sources Sources of marine debris. Plastics can enter the ocean from anywhere. Marine debris can come from sources on land or the ocean, not just coastal communities and beach-goers. It is estimated that most marine debris (80%) originates on land. Marine debris can originate in the ocean with lost fishing gear, dumping of trash, or abandoned boats · Natural events can also create marine debris when storms wash debris into streams or the ocean6 Sources of microplastics. Microplastics mainly enter the ocean in two ways: (1) through the fragmentation of larger plastic marine debris and (2) when small plastics enter waterways and travel to the ocean. Fragmentation of larger plastics – Plastics that enter the ocean have been found at the surface, on the bottom, and in between. Many plastic objects are buoyant and float at the surface of the ocean, being moved around by wind and surface currents. Plastics floating at the surface are exposed to sunlight. When they are exposed to UV waves, the plastic breaks into smaller and smaller pieces, or fragments. Plastics can also fragment when exposed to wind or wave action. Small plastic pieces entering waterways – One sources of small plastics is industrial materials such as resin pellets (nurdles). Nurdles can be lost during transportation and become debris. Another source of microplastics is personal care products. Many face wash, body wash, and toothpaste products contain plastic microbeads that act as exfoliators. The plastic microbeads in these products are designed to wash down the drain and are too small to be captured by water treatment facilities. Synthetic fibers from clothing such as fleece also travel through waterways to the ocean. One study found synthetic fibers on 18 beaches around the world and determined that washing one clothing item can produce more than 1,900 fibers that enter the sewage system.8 Sinks Microplastics can be found not only in the ocean worldwide, but also in rivers and streams. Many plastics are buoyant and stay at the surface of the ocean. However, other sinks of microplastics include sand on beaches and offshore. A collaborative study published in 2014 combined data taken by researchers all over the world about the abundance of plastics in the ocean. The data set include 680 tows, in which nets are dragged along the surface of the ocean and then the contents are analyzed. The study estimates that there are about 5.25 trillion plastic particles on the ocean surface. The team also found that there were fewer microplastics particles than they had expected,9 which may indicate that they are being removed by some process such as degradation, being eaten by animals, or sinking when small organisms attach. There is ongoing research about the sinks and potential impacts of microplastics in the ocean. Glossary Fragment – To break into smaller pieces Marine debris – Anything man-made that ends up in the ocean or the Great Lakes and doesn’t belong there Microbeads – Small plastic beads used in personal care products as exfoliators. Microbeads are commonly made out of polyethylene.